I loooove autumn sundays. Its getting colder outside, the trees outside the window turn into a beautiful collage of autumnal colours. Inside it smells like cinnamon and tangerines. It is the time for pumpkin soup . Its the time for eating tonnes of tangerines (or is that just me). Its the time for lighting candles, brewing hot tea and cuddle into the couch with your favourite book and the cat on your feet wrapped in warm socks (the feet, not the cat ;) ). Since i am still a bit moody after my tooth removal on friday, this was the perfect day for a lazy autumn sunday. I started the day with a wonderful fry up (low calorie version) and a hot autumn tea. I then decided to take a looong soak in the bath. 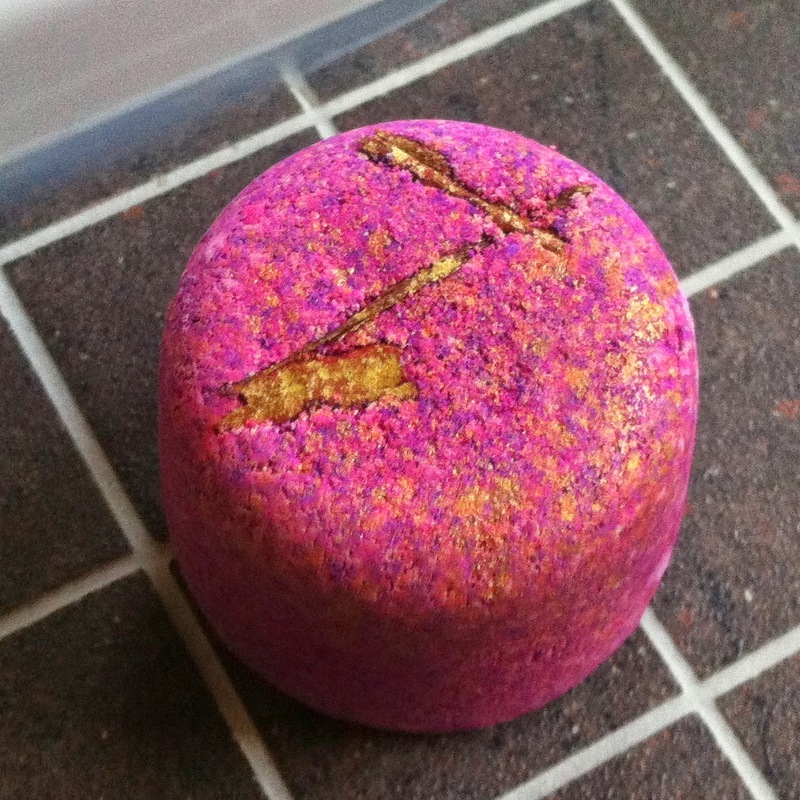 I decided to use the Lush "Rise of the phoenix" bath bomb which smells amazing like cinnamon and spicy apple (has there ever been a more perfect autumn scent). Additionally, it turned my bath into a wonderful pink. So i spend a long time just relaxing. I also applied a sea salt scrub from lush which i reviewed before (here). The oils in the bath bomb made my skin super soft. I love oily baths since they ensure that every inch of your skin gets moisturised and smooth. I also ended up having some snacks on the couch. Decidedly not low calories, but ooooh so tasty. 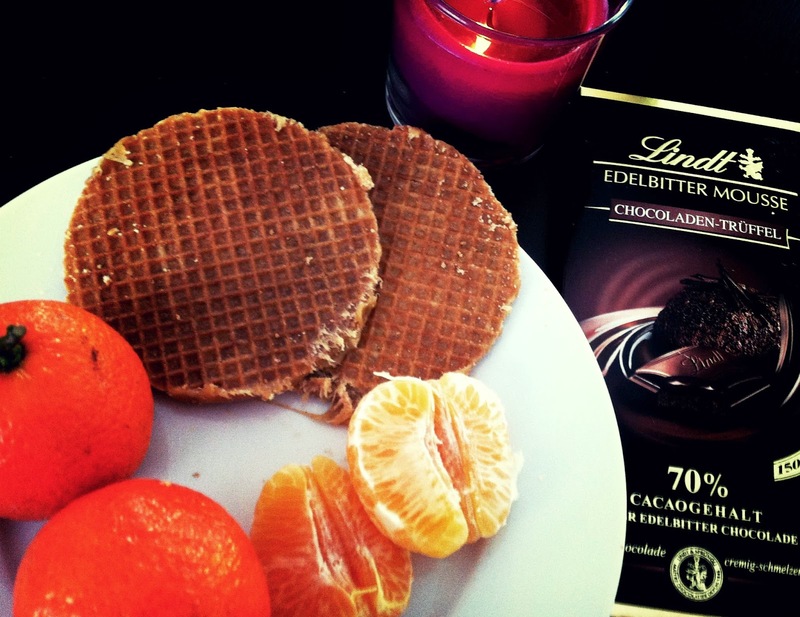 My two favourite autumn treats, stroop waffles (dutch sirup waffles) and tangerines. And one piece of my stash of my all year round favourite, dark truffle chocolate (yuuuum). I also lit some scented candles. Unfortunately my package from Yankee candles is stuck in the post, so i could not use one of my autumnal scented candles yet, however, i won't let that ruin this perfect moment. This evening we will prepare out first "stoemp" of the year. "Stoemp" is the flammish word for mash. However, this mash can contain anything. Ours this evening will be with spring onions, mushrooms and a bit of minced meat. My ultimate autumn comfort food. I hope you are enjoying your Sunday as much as i do. What have you been up too?